Hard to believe that in a few short days we are saying goodbye to so many wonderful stamps. The new catalog will be taking effect on June 1. For this week's challenge, I told myself to pick a set I am sad to see going. Fresh Fruit is near the top of the list so I thought I would highlight it today! 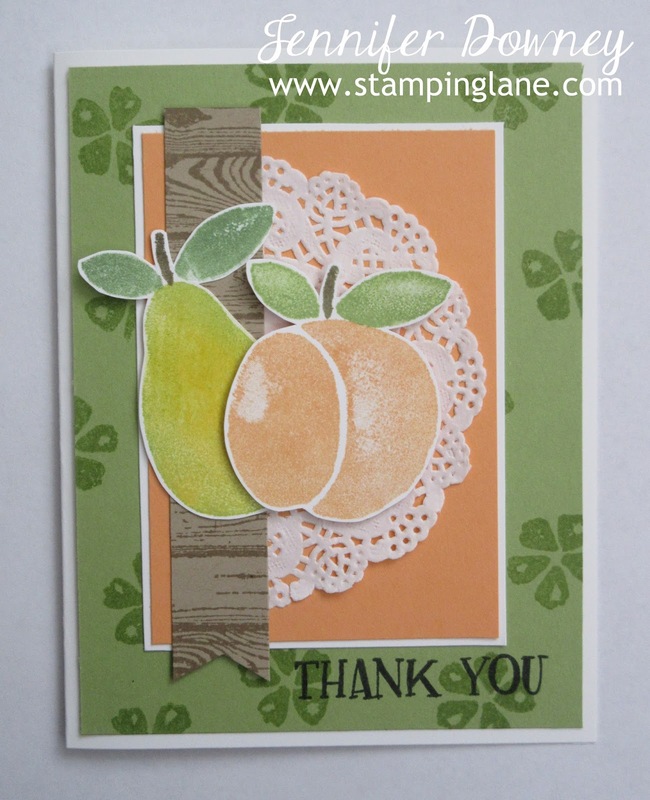 To achieve the coloring on the pear, I inked up the stamp in Daffodil Delight ink first, then took a sponge with Pear Pizazz color on it and sponged the edge of the pear before stamping it onto Whisper White card stock. The stem and leaves are colored with Wild Wasabi and Soft Suede Stampin' Write Markers. 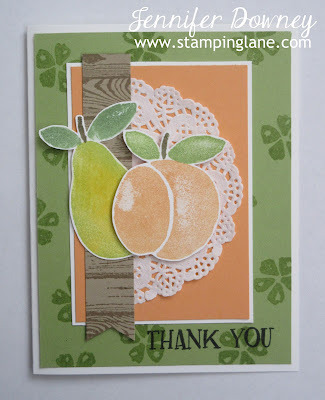 For the peach, I used the appropriate Peekaboo Peach ink pad, but instead of stamping it full strength, I stamped it first on scrap paper then onto Whisper White card stock for a softer shade. It's stem and leaves were colored with Soft Suede and Pear Pizazz Stampin' Write Markers. I hand cut out both. 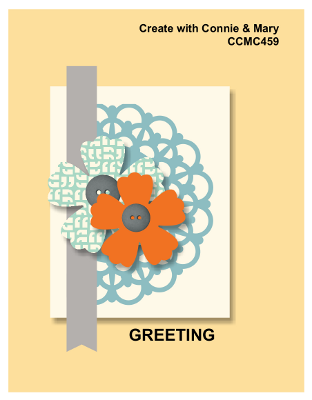 The background flower and greeting are also from the stamp set. I love it when sets have images and words. Makes life easier when you are short on time! Hop on over to Create with Connie and Mary to see all the other fabulous creations with this sketch and then play along. Happy Stamping! I will miss this stamp set too! Your coloring of the pear is fabulous. I will have to try it and soon! I was surprised that this stamp set was retiring. I really bought it because the peach can be used to make a tennis ball. That's why I'm keeping it. My husband is a tennis player. Cute card.